After a brief delay and more than a year of chatter, Advanced Micro Devices on Monday announced the availability of its first 16-core Opteron server chips, which pack the largest number of cores available on x86 chips today. The new Opteron 6200 chips, code-named Interlagos, are 25 percent to 30 percent faster than their predecessors, the 12-core Opteron 6100 chips, said John Fruehe, director of product marketing at AMD. The chips are shipping now and will be available in servers from Hewlett-Packard, Dell, Cray and Acer in the coming weeks, Fruehe said. The processors are based on AMD's new chip design called Bulldozer, which provides bandwidth and performance improvements while saving on power. The chip shipments were delayed by a few weeks, said Dean McCarron, principal analyst at Mercury Research. The delay came as AMD tries to reverse its sagging fortunes in the server market after losing ground over the past year to Intel. AMD's worldwide server market share was only 5.5 percent during the second quarter this year, while Intel held a 94.5 percent share, according to IDC. AMD has also been dealing with customer complaints about the company not meeting product road maps. The five 6200 chips -- 6262 HE, 6272, 6274, 6276 and 6282 SE -- run at clock speeds between 1.6GHz and 2.6GHz, and are priced between US$523 and $1,019. The chips draw between 85 watts and 140 watts of power and will plug into existing server sockets to replace older 12-core chips. "The 6200 is targeted at really scalable applications, things that have a lot of threads," such as databases, cloud and high-performance computing, Fruehe said. The processors are for heavily threaded and virtualized server environments, Fruehe said. Linux and Microsoft's Windows Server 2008 operating systems are tuned to take advantage of 16 cores, and more instances of virtual machines can be created to handle transactions, Fruehe said. The Bulldozer architecture mixes the CPU with integer units and a shared floating point unit so more operations can be executed per clock cycle while drawing lower power. Other chip improvements include Turbo Core technology, which can increase clock speed by up to 500MHz across all cores and up to 1GHz on some cores depending on the performance required. AMD in recent months restructured its management, and new CEO Rory Read has said a top priority is to boost the high-margin commercial business. Read acknowledged that customers complained about AMD's inability to deliver products on time, and one of his top priorities was to fix chip manufacturing, shipment and delivery issues. The Opteron 6200 is an important product in AMD's server road map as it's an anchor product, Mercury Research's McCarron said. "It's part of them getting re-established. They had seen quite a bit of erosion in share over the last year or so," he said. AMD has had some important wins with the chip, McCarron said. One of them is at the U.S. Department of Energy's Oak Ridge National Laboratory, where a supercomputer called Titan is being built with AMD's 16-core processors and Nvidia's graphics processors to deliver up to 20 petaflops of peak performance. The supercomputer will outpace Japan's K, which at 8 petaflops was the world's fastest computer in the list of the world's fastest supercomputers issued by Top500.org in June. Opteron's launch comes ahead of Intel's Xeon E5 server processors, which are already in production and expected to reach servers in the first half next year. Intel has around 400 design wins for Xeon E5, said Kirk Skaugen, vice president and general manager of Intel's Data Center Group, at a technology conference earlier this week. AMD also announced the availability of Opteron 4200 chips, which will come with between six and eight cores. The chips operate at clock speeds between 1.6GHz and 3.0GHz, and are priced between $125 and $377. 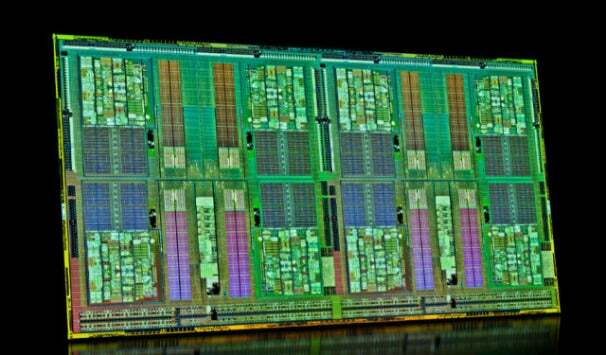 The 4200 processors are for dense server environments with low-power consumption, Fruehe said. The chips draw between 35 watts and 95 watts of power, and as low as 4.3 watts per core, Fruehe said. There is a growing interest in low-power ARM processors as server makers deliver systems that can help companies cut electric bills. But Fruehe said AMD's processors have a leg up over ARM processors, which lack server features like larger memory addressability and 64-bit capabilities. "When you look at some of the things like ARM, good technology, but when you look at the server markets and the needs ... they are really only hitting a small part of the market way down at the bottom where some of these things don't matter," Fruehe said. High-powered server chips will be needed for back-end servers running data-intensive applications or rendering images delivered through the cloud, Fruehe said. "There's no way that a 1.4GHz ARM processor is going to be able to perform at the same level as an x86 processor," Fruehe said.